This car was beautiful from any angle. 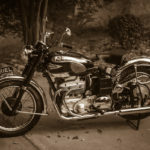 It saw the introduction of BMW’s now-famous inline 6 cylinder engine, still touted by many automobile technophiles as being one of the smoothest, most reliable engines ever built. The CS coupe also represented many “last-times” in BMW’s history. This became the last coupe to be a true pillarless “hardtop”. It was also one of the last BMW’s to sport true wood trim as well as lavish chrome and stainless steel accents. Just as noteworthy as the incredible styling are the wonderful handling characteristics of the CS. This 4-seat coupe weighed in at a mere 3029 lbs, comparing very favorably to its contemporary, the 1972 Corvette of 3185 lbs, contributing to its light and nimble demeanor on the road. The lightweight chassis, coupled with an ample 180 HP engine was sufficient to propel the coupe to a respectable-for-the-era 0-60 time of 8 seconds. 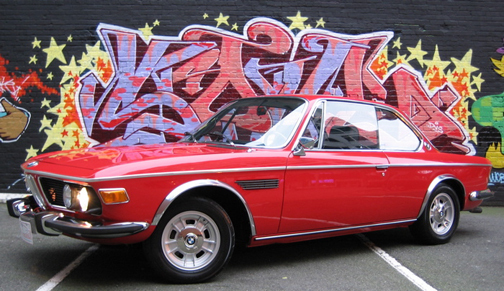 The CS coupe, which was the top of the line model for BMW, did not come cheap. List price for a well-equipped 1972 model came in at a whopping $14,500. This compares unfavorably with new Corvette pricing of the same vintage, which could be had for a mere $5,472. MY coupe represents my second ownership of this model (the first being a traditional Fjord Blue automatic coupe with dark blue leather back in the ’70’s, which succumbed to the dread rust worm, and had to be put down). “Dietmar” joined our collection after an extensive search for the right one. 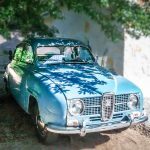 I was looking for a car in some color other than the common light blue or silver, wanted a manual transmission and hoped to find one with an upgrade to Weber carburetors, a somewhat popular modification. My search finally ended in Seattle, where “Dietmar” was located, and owned by the son of the original owner. Dietmar is a European model, which means it comes with the much more sleek chrome bumpers, rather than the boxy and cumbersome “DOT” bumpers required of period US cars. European models were also devoid of the huge slapped-on side reflectors, again required for US destination. In addition to the striking Verona Red paint job, Dietmar had been upgraded by the previous owner with a trio of Weber twin-throat DCOE40 carbs, the same as those found on period Ferraris. Additionally, the originally equipped automatic transmission had been replaced with a later model BMW 5 speed manual transmission. This car had my name on it! After some negotiation, I worked out a deal, and flew out to Seattle picked up the car, and drove it all the way home… down the Pacific coast to Southern California, then out I10 across the desert back to Austin. When approached from the outside, the coupe is more much dimunitive in size than pictures reveal. Once inside, however, there is plenty of room. The seats sit high, yet still allow plenty of headroom. The pillarless coupe, along with the minimalist A and C pillars provide a light and airy sensation, with near-360 degree view of the outside surroundings. This IS a 4-seat car, but the rear seating, although lushly contoured in leather, falls in the category of 2+2.. i.e., rear seats fit only for small children, dogs, and the occasional grocery bag. Let’s face it, this is a 2-person touring/sports car! The best feature of the CS coupe however, is the driving experience. The perfectly balanced power steering offers adequate assist while maintaining good communication with the road. The 5-speed transmission shifts smoothly and positively, falling right into the desired gear with little effort. The overdrive 5th gear allows endless high speed highway cruising at loafing RPMs. The modified engine winds eagerly and smoothly to its 6500 RPM redline again and again without protest. The lovely song of 6 wide-open Weber throats just can’t be duplicated in today’s computerized, plastic covered engine compartments. The car’s handling demonstrates the heritage of its predecessor, the famed and still sought after 2002 coupe. The independent de Dion rear suspension keeps all four wheels firmly planted on the ground on the most challenging roads. I believe the CS was the last, true sports coupe to come out of BMW’s factory. The successor of the CS, the 1976 630 coupe was a full 200 lbs heavier, and offered numb, barge-like handling to the driver . The progression of dumbed-down, bloated, ill-handling coupes continues sadly to this day, with the current iteration of the top-of-the-line BMW coupe, the 645, weighing in at a whopping 4180 lbs., some half-ton more than the nimble and quick CS coupe, and being nothing more than a huge boulevard cruiser. “Move Up” to a new BMW coupe? No thanks, I’ll stick with my little CS! 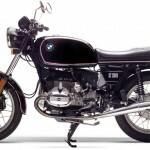 BMW R100/7 - Airheads Rule!